Relate: There are a few different common phrases that can show how messed up and off base our modern Western society is. I could go on and on. We say, “My conscience is clear, so everything must be fine.” But Paul, under the inspiration of the Holy Spirit, said the exact opposite. He wrote, “My conscience is clear, but that does not make me innocent.” (1 Corinthians 4:4 NIV) How deeply does this go against the grain or our modern ideal? To illustrate how completely off based self-justification can be, I think back to a time I was in NYC for an off-Broadway comedy night. Apparently, they front-loaded the talent. The first act was great, the second one was good, the third was OK and the last two were just terrible. One of those terrible acts had the potential to be good except the guy really botched it right out of the gate. Sometimes a comedian will first try to interact with the crowd to try to get a feel for their audience and what they respond to. This comedian pointed out a woman just to my right and asked her what she did. This large, assertive woman folded her arms and said, “I tend to my own business.” Apparently, the poor guy on the stage didn’t know how to take a hint because he responds, “No seriously, what do you do for a living.” She ignores him, more than once but he keeps trying to reword the question and ask again. Finally, she squares her shoulders, glares at the little guy half her size and says, “I told you, my job is to mind my own business. Your job is to be a comedian. So go ahead, tell a joke. Make me laugh.” There is an awkward silence for about thirty seconds as it finally sinks in for the poor guy that he chose the wrong audience member to interact with. Unfortunately, he goes and compounds his mistake by trying to mock her to everybody else. He turns to the other side of the audience and says, “Can you believe how rude this woman is?” He then begins to pull out some of his “angry black woman” jokes. Nobody is laughing. We are all thinking, “This middle-class racist white boy needs to get off the stage.” It doesn’t help that he is so angry that he is almost visibly shaken. Clearly, this guy felt justified in thinking he was the victim in the exchange. Clearly, nobody else agreed. Sometimes my own self-justification is as completely off based as that poor comedian. No matter how wrong I might be, it seems that my mind is always, like an expert lawyer, building my defense. Often it justifies what I have done, maintaining my innocence through some convoluted twisting of logic that doesn’t seem so convoluted to me. If complete innocence is impossible then it will work on either sharing or minimizing my guilt. (Often both). There is no end to the hoops my ego will jump through to try and keep my conscience clear. And I don’t even realize it is happening. Although I never notice when I am doing this, it is easy for me to spot the same fault in others. I want to just say to them, “You’re wrong. Just admit it.” Except I know the response will always be, “No I’m not because…” or “I know, but…” Can you imagine Adolf Hitler at the Pearly Gates? St Peter asks, “Do you think you are innocent?” He answers, “Of course I am. Everything that went wrong… its the Jew’s fault.” St Peter responds, “Well if your conscience is clear then you must be OK. Come on in.” Thank God their own conscience isn’t the final arbiter of their ultimate innocence. 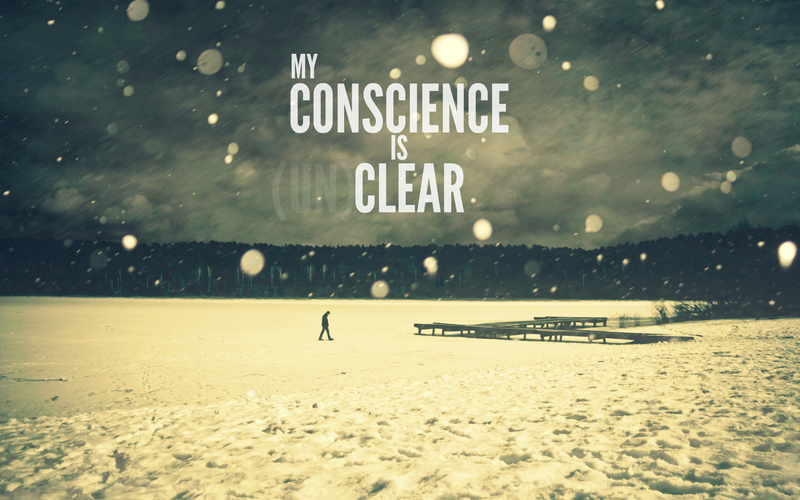 But then I look in the mirror… dear God, my own conscience isn’t the final arbiter of my innocence either. I have some really dumb ideas sometimes. What is even worse, I have some great rationalizations for why those ideas weren’t really so dumb. My mind is never harder at work than when it is trying to prove my innocence. I’m not innocent. I know this, but help me to truly recognize it. Help me to man up and say, “I am wrong. I’m sorry.” When it is necessary. Help me to be humble and teachable around others. Forgive my arrogance and help me to ever rely on Your wisdom and Your judgment. Thanks for your always on target, and encouraging words! God Bless you! We have a trail in the town I live in called The River Walk. I will have to take a picture for you! I would love to see it. I used to pray as I walked up and down the River Walk in Binghamton NY and it was during one of those prayer times that the idea to start this devotional was born. Wise and thought-provoking. Thanks for another great blog. God bless. Your reflection is a reminder to me of how insidiously seductive the world can be – we let so many things slide till we don’t know how we land up where we are! This is spot on! How many times have I heard myself, and others, use self justification to excuse wrongdoing. Thank you for pointing to truths of which I need to be reminded. O my Brother! I can’t help it but to respond to you. You are 100% right. All those excuses to prove our innocence? Totally wicked! lol The Truth? I don’t know you. You don’t know me. They don’t know us. But the Father knows both of us and all in the boot for sure, and? He declares us all: GUILTY! But? O His infinite mercy! He is saving us from our own wicked selves despite our distasteful hypocrisies. His plan to restore us to the original intent for our creation is in effect. Don’t you agree? “Well if your conscience is clear then you must be OK. Come on in.” Our consciences may be clear. But if our wills are not in line with God’s, then we are not getting in.